Ammonite fossils have intrigued mankind for centuries. There are myths and legends about them from cultures all around the world. Here are a few of those stories. The Blackfeet Indians called ammonites buffalo stones for their resemblance to a sleeping buffalo. They were considered good fortune and used in ceremonies before a buffalo hunt. It was also good fortune to find an ammonite just before taking a journey. Long ago in Germany a remedy for a cow gone dry was to put an ammonite in the milk pail. Scotland had a variation on that theme. It was said that washing a cow with water that had an ammonite in it for a few hours would cure the cow of cramps. They were called cramp stones. 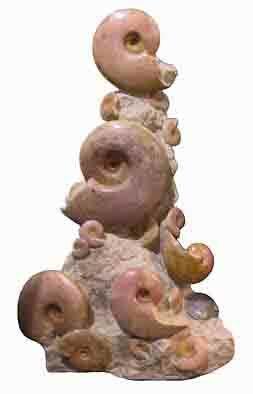 In England ammonites were called snake stones. One story has it that Saint Hilda, the Abbess at the double monastery in Whitby c. 650 A.D., wanted to build a convent there as well. Alas, the ground for the building was infested with snakes. St. Hilda, through devout prayer, caused the snakes to curl up and turn into stone.Around Whitby there is a tradition of carving heads on ammonites or snake stones. There is even an ammonite named after St. Hilda, the Hildaceras. GreeceIn ancient Greece it was said that if you put an ammonite under your pillow it will cure insomnia and bring good dreams. When in Rome…The Romans believed that if you put a golden ammonite (pryritized) under your pillow you would have prophetic dreams. Want some factual information on ammonite fossils? Click here.